This Saturday, April 11, we are having a Sidewalk Sale! All of our current sale fabrics will be $5/yd, there will be lots of patterns for $2.50, and more, much more! We're in Spring cleaning mode, so be sure to come by and check out all the fantastic bargains. We get a spruced up shop, you get great deals! Quilt Rush is next week! 16th Annual Shop Hop - “Connect the Dots"
and 10am to 4pm Sunday. On Wednesday (Apr 15, 10a - 4p) and Thursday (Apr 16, 9a - 1p), Cindy Needham will be demonstrating her "brand new, one-of-a-kind set of designing stencils! They are the only stencils you will ever need." The stencil set sells for $25 and includes both square and circle stencils. On Friday through Sunday (Apr 17-19), Christy Flower of Higher Vibrationz will be at the shop selling her beautiful, unique jewelry. Christy's creations include wire-wrapping, metal folding, and beautiful beads and stones. 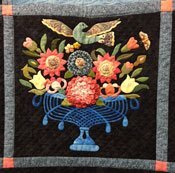 Sue Spargo's Bird Dance (full), Sat, Apr 11, 1:00 - 4:00 p.m.
-OR- Tues, Apr 14, 9:00 a.m. - noon -OR- 1:00 - 4:00 p.m.
Handwork Sit & Sew, Mon, Apr 20, 10:00 a.m. - 4:00 p.m.
American Girl Doll Sit & Sew, Wed, Apr 22, 1:00 - 4:00 p.m.
Saltbox Farm (full), Mon, Apr 27, 9:00 a.m. - noon -OR- 1:00 - 4:00 p.m.
Blankets for Preemies, No meeting in April. 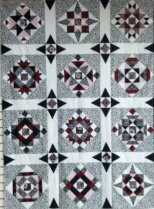 You Can Quilt Your Own Quilts, Beth Kondoleon, Sat, April 25, 10:00 a.m. - 5:00 p.m., $40, supply list. Do you have a stack of quilt tops completed just waiting to be put together and quilted? Come join Beth to learn how to quilt those quilts yourself. She has hundreds of designs to choose from and customize to just the right size for your quilt! Beth can show you how to transfer the designs to your top for quilting, how to pin baste those layers together and start quilting your quilts! Come join the fun in this open workshop.